On a recent trip to Spain, I found time to visit Valencia, the spiritual home of one of my favourite dishes. Over the 48hrs we were there - just in case there were any doubts over my commitment to gastronomic research - I visited five of the more famous paella eateries. This gluttonous adventure finally culminated, together with several large glasses of rioja, at the hundred year old La Pepica restaurant overlooking the white sands of Playa de Malvarossa. There is definitely something to be said for eating paella under the Spanish sun, but I think that the warming spice and comforting carbs are even more effective as an antidote to a grey English winter. Often described as the Spanish national dish, paella is actually the signature cuisine of the Valencia region. Developed in the 19th century as a cheap and nutritious way to feed local workers, it used the local Calasparra rice and whatever protein was in season - water vole and eel were particular favourites. Thankfully though, a "traditional" paella nowadays is more likely to contain chicken, chorizo, rabbit or snail than trapped rodents from the local river. The pan: the word "paella" means "pan" and most afficionados would insist that you cannot make a great paella in anything other than a traditional paelleras. I have to say that this is not quite true, the key is to ensure that as much rice remains in contact with the pan as possible, so that the socarrat (see below) can be created. This means a good wide-bottomed frying pan will do the job, although I do concede that nothing beats a real paella pan for that authentic touch when serving. The rice: short grained Calasparra rice is really the only choice, with Bomba being the most famous. These varieties absorb up to 3 times their own volume in liquid, ensuring the paella is packed with flavour from the saffron and paprika infused stock. It also ensures that the paella remains moist, despite the lack of sauce in the dish. The cooking: despite some of the versions I have eaten, paella should not resemble risotto. Luckily, this also means that it doesn't need the same constant stirring and attention. When cooking a paella it should be left alone to do its thing. If you want to create your own taste of Spain, try my delicious Paella Valenciana recipe. This post first appeared in the Ashburton Cookery School online newsletter. As my wife will happily attest, I am a man with many failings - including my unrequited love for great pizza. 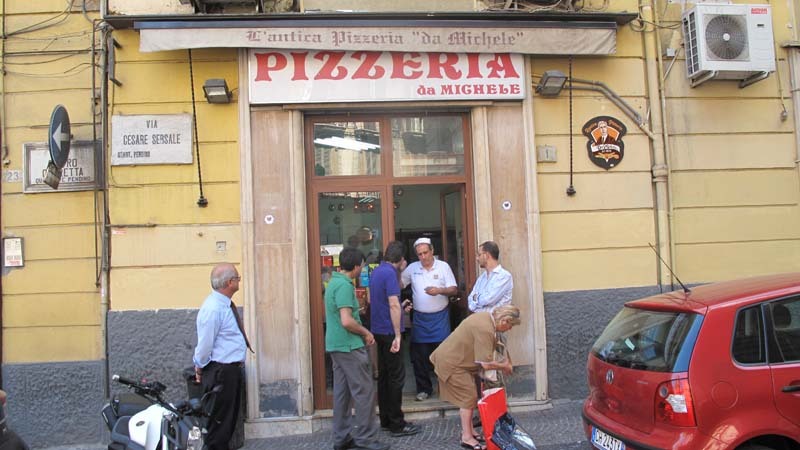 We once interrupted a perfectly romantic holiday just so that I could taste the legendary offerings of Pizzeria Da Michele - the home of the world's greatest pizza according to experts such as Heston Blumenthal and Diego Maradonna (and I am guessing that he knows his pizza...). We dragged our huge suitcases along Naples' Comorra-controlled side streets - dodging the piles of stinking rubbish created by the latest refuse collectors strike - to find a run down cafe with a queue of scruffy looking locals snaking out of the door. There are no reservations here, you just take a ticket and share a table as soon as a seat becomes available. The restaurant only has two things on the menu: margherita and marinara but they are as good as any pizza I have ever tasted - that Maradonna really knows his stuff. So, what can you do to reach similar levels of perfection if you are not lucky enough to live in Naples and fancy making a pizza at home? The main rule is that a pizza must be thin and it must be crispy. Pizza Hut may have made millions from deep pan, cheese filled crusts but when I become Prime Minister I am afraid they will be banned. A pizza base is a simple thing - just water, flour, yeast and salt - so use finely ground "00" flour, maybe with some semolina flour to add colour and flavour, and the best Cornish sea salt. You will taste the difference. Finally, give it time - use less yeast but allow it more time to work. This will create a much more flavoursome dough. The pizza sauce at Da Michele is little more than cooked san marzano tomatoes, but I like the more complex flavours of a New York pizza with its herbs and long slow cooking. It's not difficult to make and freezes well, so you only need to make it a couple of times a year, even if you have a Maradonna-esque pizza appetite. A recent survey showed that 37% of all pizzas bought are of the plain cheese and tomato variety. This means that your ingredients need to be good: a light dusting of parmigiano reggiano, some torn buffalo mozzarella and a few fresh basil leaves should do - just don't be tempted by that pre-grated supermarket nonsense. If you do need meat on your pizza, and I can understand that, ask your delicatessen to slice some prosciutto until it is paper thin and then drape it over the pizza after cooking so that it melts in the roof of your mouth. Top with some fresh rocket leaves dressed in lemon and olive oil. Simple. As I have said, getting a thin, crispy base is always going to be a struggle without a wood-burning oven. However, you can achieve the impossible with the help of the "frying pan method" espoused by the Pizza Pilgrims in their book "Recipes from the backstreets of Italy". This simply involves getting a dry frying pan screamingly hot, cooking the pizza for 2 minutes on the hob and then putting it under a hot grill for another 2-3 minutes until charred and blistered. If travelling to Naples to try a cheese and tomato pizza seems a little excessive, which I suppose could be excused, try my ultimate homemade pizza recipe. This wasn’t a food holiday, but we did visit some fantastic markets (particularly in Pula) and a cheese factory on Pag Island where we shown how they make the award winning Paski Sir sheep cheese. As well as the lovely food, both countries are also blessed with amazing natural beauty (if you get the chance, you must visit the Postojna caves and try swimming with 4-foot catfish in lake Bled). It seems a shame to encourage more tourists to flood the Balkans, but I think it’ll only be a matter of time before they start to seriously challenge the traditional Mediterranean hotspots, so take my advice and get in before they become too mainstream. A week away from the kids was a challenge, but they had a great time with their grandparents, and our travel companions Sue, Sylvia, Brian, Julie, Wendy, Paul, Katrina, Ariana, Martha and Michael made this a really memorable trip. Thanks guys!